For nearly 25 years, Eric Aho has depicted the landscape as a means to investigate and expand the boundaries of painting and personal inquiry. Since his earliest projects, Aho has brought historical research, personal relationships, and a close reading of the landscape together to reinvigorate traditional portraiture and challenge what it means to paint the landscape today, in works that are both representational and dynamically abstract. In this exhibition, Aho presents a suite of recent works–some on public view for the first time–that extend his painterly explorations. Approach (2012), from Aho’s Mountain Series, portrays an image of a looming mountain, which for the artist represents an impending journey and ambiguous goal that relates both to the process of painting, as well as to traveling an unfamiliar landscape. His monumentally scaled triptych (2016), after which the exhibition is titled, similarly depicts an icy mountain-scape, and is inspired by the British Explorer Henry Worsley, who recently attempted but failed to complete Ernest Shackleton’s aborted trans-Antarctic journey. 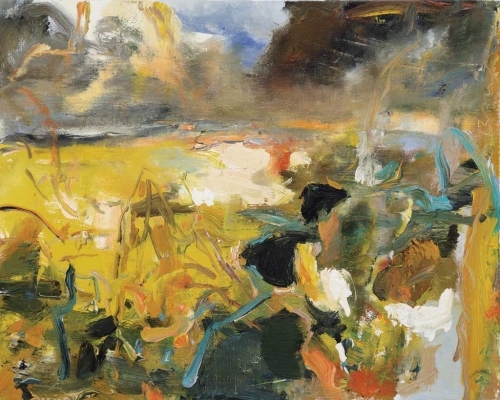 This and other paintings—including a group of Aho’s “Landscape Portraits” (2011-present)—reflect the artist’s fascination with connecting with a person or historical moment through the process of painting. This idea is powerfully conveyed in Aho’s ongoing Continental Series (War Paintings) (2014-present), comprising over 50 individual works that trace the path of his father’s combat engineer battalion during World War II. This series joins painting and research methodologies to construct layers of memory, history, cultural landscape, oral history, and art history, all brought together in his painterly works.